More vehicles could go off the roads and all construction sites and some more factories in Beijing and its neighboring areas could be closed temporarily if the capital's air quality deteriorates during the Olympic Games. The Beijing authorities are likely to announce the special measures for the Aug 8-24 Games soon, the city's environment authority said yesterday. Li Xin, a senior engineer who has drawn up the plan for the Beijing Environmental Protection Buearu, said: "We will implement an emergency plan 48 hours in advance if the air quality deteriorates during the Aug 8-24 Games." Talking to China Daily over the phone, she said the environment authority would inform the public as early as possible about the details of the plan. 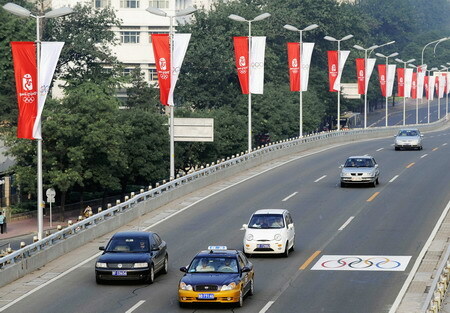 Zhu Tong, an environmentalist, has suggested keeping up to 90 percent private vehicles off the streets during the Games as part of the plan. Only vehicles whose license plate ends with the last digit of the date should be allowed to hit the road, he said. Beijing began its biggest ever pollution-cleaning campaign on July 20, imposing the even-and-odd license number rule for vehicles. This means vehicles whose number plates end with an even number drive on one day, followed by those that end with an odd number. Only about half of the city's 3.3 million vehicles have hit the roads on any given day since then. But the recent hot and sultry weather, with occasional breeze, and the still high emission level, have raised fresh concerns over the weather during the Games. The city has not experienced a "blue day", that is, healthy air quality in the past four days. The air pollution index (API) has stayed above 100, the national standard for good air quality. Yesterday's API in the city was between 103 and 124. The smog yesterday was likely to have been caused by poor weather and emissions both, Du Shaozhong, deputy director of the Beijing environmental protection buearu, told reporters at the Main Press Center for the Games yesterday. Du said tougher plans are ready to safeguard athletes' health. Besides Beijing, the special measures will have an impact on residents and factories in Tianjin and Hebei province, too. Tianjin has issued its emergency plan that includes expanding the odd-and-even vehicle number plate rule and shutting down gas stations to complement Beijing's effort.